The crest block is wood, c. 1-1/2" wide by 1-1/4" thick in height. (It can be cut from a nice 2x6.) The exact size and shape depend on your helmet and preferences, but it is approximately semi-circular. The ends should not quite touch the helmet at the attachment points at front and back, and the center is 1-1/2" to 2" above the crown, supported by the crest support. The placement of the central support and its holder will also influence the crest's shape. (For instance, is the support inserted into the front of the holder or the rear?) Make a cardboard pattern first to be sure of the shape. Cut the block out carefully and sand it well. Mark the locations for the holes, 1/4" in diameter, 1/4" apart (1/2" on center), and c. 3/8" deep. Three staggered rows work well. There can be about 100 holes. Drill them carefully, as the wood grain may cause the drill to drift off-target. When the holes are done, sand the top of the block again and paint the whole thing red. Before installing the hair or feathers, add the fittings for securing the crest to the helmet. 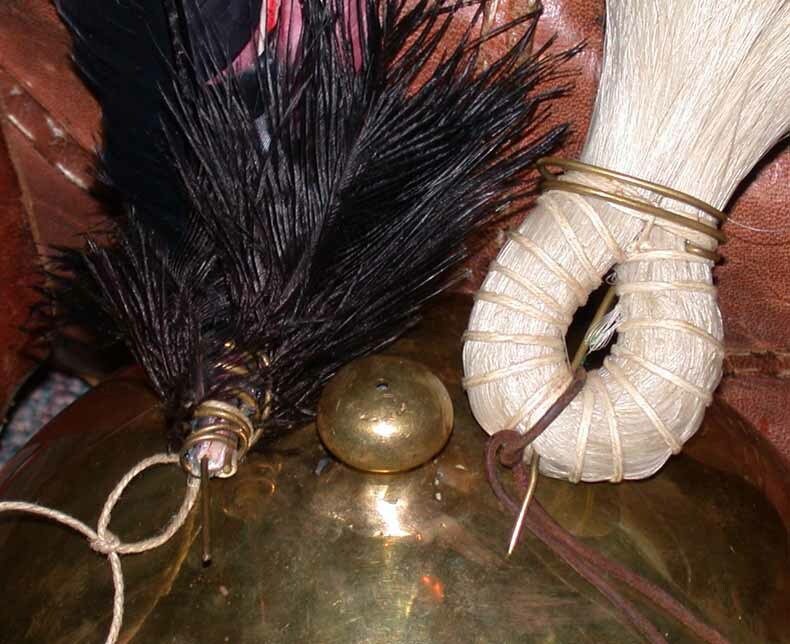 A small ring at each end, held by a folded strip of brass which is nailed to the underside of the block, can be connected directly to a hook on the helmet, or tied to a ring (or hook). The only evidence for decorated crest blocks comes from sculptures of officers such as on the Cancelleria relief, so if you want to add decoration you can discuss options with the Commander. 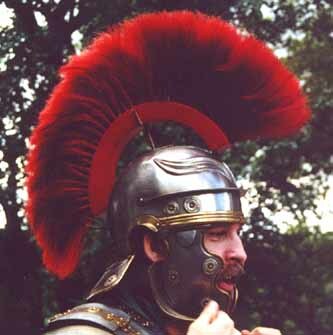 There does not seem to be any solid evidence that the Romans used striped or multi-colored crests. Horsehair can be purchased from leather companies such as those listed on the Suppliers page. About 8 ounces of white horsehair is needed. (One ounce will make 12 to 14 twelve-inch tufts.) It usually comes about 24" long, so start by cutting it to about 12" long. Separate the hair into four or six bundles tied tightly in the middle, and dye it red with Rit Scarlet fabric dye in a large kettle on the stove. Follow the directions, making sure to keep gently stirring and moving the hair, and not allowing it to get too hot, or it may curl and frizz. About half an hour should get a deep enough red color. Do not substitute leather dye as it is not waterproof! Lay the hair flat and straight to dry. When dry, separate the hair into as many little tufts as there are holes in your block, and tie each tuft in the center with heavy thread. Don't worry about the white middles of the strands. Fold each tuft in half and glue it into a hole, using hide glue, Elmer's Carpenter glue, or equivalent. When the glue is dry, comb the hair gently with a fork or coarse comb and give it a light trim. When finished, the hair will stand up 5" or 6" tall, and it should be stiff enough to stand up nicely. But always store the crest laying flat or (better yet) hanging upside-down. If you leave it displayed on your helmet while not in use, the hair will droop. Feathers can be used instead of horsehair, and red ones are available from leather and craft stores. They may have to be trimmed a couple inches. If your helmet has feather tubes at the sides you may wear a feather in each of them, no matter what your crest is made of. 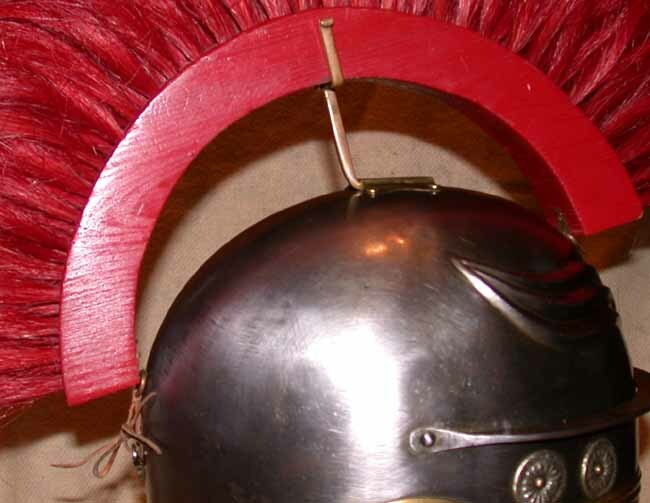 The crest support for an Imperial-Gallic helmet can be cut from a square-section 1/4" brass or steel rod 5" to 6" long. Make a 2" cut in one end with a hacksaw, and bend the arms down to a T-shape. Then bend up each arm so that your crest block fits between them, and finish the tips by curling them down. Anneal the metal before each step. Making sure that the center post is the right height to support the crest where you want it, bend the bottom end to form the foot or tongue, and grind or hammer it flat to fit the holder on your helmet. Finally, file, sand, and polish it well. The arms can be squeezed together slightly at the top to give them a firm grip on the crest block. 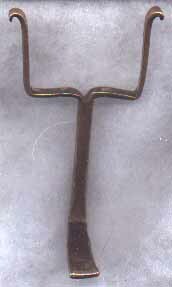 Crest supports made of brass are apparently more common finds than iron, but quarter-inch square steel stock is readily available and easier to work. 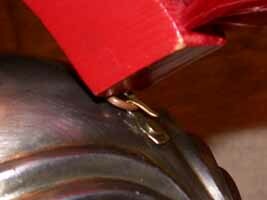 Brass must be annealed and allowed to cool, often more than once to make each bend, to avoid cracking or breaking; steel can be worked hot or cold with very little chance of breakage. See the Armoring Hints page for more information. 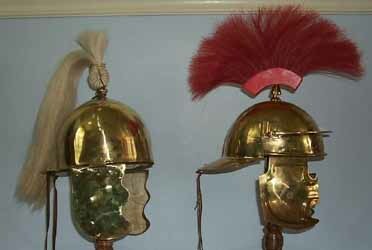 Imperial-Italic helmets have "twist-on" supports, usually cast: a T-shaped stud on the bottom fits into the slotted disc on the helmet and secures with a quarter-turn. Some have a spike between the arms which would fit into a hole in the crest block--this could be secure enough to dispense with hooks or rings. Many depictions show a comparatively short block mounted directly on the helmet. Judging by the archeological evidence this would not be the most common style, but a U-shaped support with a T-stud on the bottom has been found. This would result in a "flush-mounted" crest similar to those illustrations, and is an option for some Italic helmets. Coolus helmet crest knobs often have a slot crossed by a hole. A metal tongue on the bottom of the crest block (or set into a conical hole) fits into the slot and is secured by a pin. The crest block would be quite short in this case. There is also evidence that some Coolus helmets carried a longer crest (c. 1/3 of a circle), anchored to the knob near its front end, while at the back a metal tongue was slid under a strip riveted to the skull just above the neckguard. Montefortino helmets generally have a knob with a vertical hole. While a Coolus-style crest could be "retro-fitted" to this, it was designed to accept a pin on a simple plume or "tail" of horsehair. This is acceptable for Legion use as long as it is red. Four or five ounces of horsehair, 24 inches long, is needed. Detail of the Montefortino crest knob and horsehair "tail" shown above. Heavy linen thread is wrapped around the hair and glued, then the wire is wrapped around, the end pointing down through the bundle to form the pin. 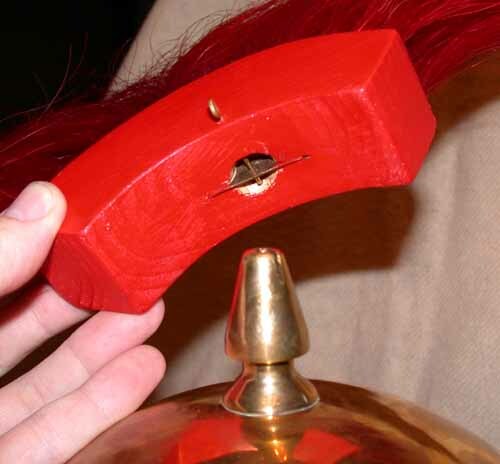 The thin leather cord is tied around the knob to secure the crest. At right is the base of a Punic War-era feather crest, three black and purple feathers, similarly bound with wire which forms a pin. While you will probably want to display your crest when not in use, it is better to store it carefully. It is the one item of equipment which should NOT show wear and tear from campaigning. Keeping it covered and laid flat--or better yet, suspended upside-down--will keep off dust and prevent drooping. The best option is to construct a sturdy cardboard box with strings or wire twist-ties inside to keep the crest from sliding around. Make a place for the crest holder, too. Custom armorers such as Lonely Mountain Forge and Manning Imperial are the best bet for a good crest. Unfortunately, the crests made by Deepeeka for their helmets are not acceptable, being too narrow, with the hair glued into metal crest boxes. There have been reports of the hair coming loose, as well.